This summer visit one of Seattle’s top tourist attractions, The Hiram M. Chittenden Locks. The locks carry more boat traffic than any other locks in the US, and the locks, along with the fish ladder and the surrounding Carl S. English Jr. Botanical Gardens attract more than one million visitors annually. Walk around and enjoy the day as pleasure boats, tug boats, and work boats make there way in and out of the locks. You can also enjoy the sights and sounds of Seattle from the water on a 2.5-hour narrated cruise along Ballard Locks aboard the Argosy Cruise Line. 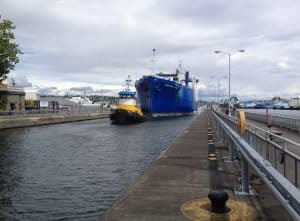 Learn how the locks work as the boat is lifted to the freshwater level of the ship canal. Learn about Seattle’s historic waterfront and take in the view of the city’s skyline with a spectacular panoramic background of the Cascade and Olympic mountain ranges, including majestic Mt Rainier. See the houseboat and waterfront homes of the area’s rich and famous. This entry was posted in Seattle Events, Seattle Tours by admin. Bookmark the permalink.